Salt Lake City has a semi-arid, temperate climate with four distinct seasons. Utah is the second driest state in the nation behind Nevada, with yearly precipitation averaging 12.26 inches. The Salt Lake City area is less dry, with an average of 16.5 inches of rainfall at the airport and about 20 inches on the benches. Utah's low humidity may be hard on everyone's hair and skin, but it keeps winter temperatures from feeling too cold and summer temperatures from feeling too hot. Extreme heat is more common than extreme cold in Salt Lake City, with temperatures exceeding 100 degrees Fahrenheit (38 degrees Celsius) an average of five days per year, and falling below zero an average of two days per year. Salt Lake City's overall average temperature is just over 52 degrees Fahrenheit (11 degrees Celsius). Salt Lake City's temperatures begin to rise in spring, despite snow still being common in the mountains. Late spring skiing continues at most resorts until mid-April. In ideal weather, it's not uncommon to ski at the mountain resorts and play a sunny game of golf down in the valley on the same day. What to pack: Spring is still chilly, so you'll want to make sure you've packed a coat, scarf, gloves, and a hat—much like your winter packing list. If you're planning on skiing, you'll need waterproof ski pants, heavy-duty gloves, and goggles or sturdy sunglasses, as the snow can be extremely reflective. Salt Lake City can get quite hot during the summer, especially at the lower elevations in the valley. It's not uncommon for temperatures to reach or even exceed 100 degrees Fahrenheit (37 degrees Celsius). At higher elevations, temperatures can be as much as 20 degrees cooler, making summer a great time for outdoor activities, whether you enjoy hiking, biking, fishing, or climbing. Summer in Salt Lake City is also quite dry, so you need not worry about rain spoiling your plans. What to pack: Bring lightweight, breathable layers for your summer vacation in Salt Lake. Temperatures at higher elevations can be cooler, so at least one sweater or shawl is a good idea, especially for evenings. Otherwise, shorts, a T-shirt, and sandals will be appropriate most of the time. In the fall, temperatures in Salt Lake Cool down, but the season is still warm enough for outdoor activities. Vibrant fall foliage in the area draws people outdoors and rightfully so—canyons are full of red, orange, and yellow hues. Be prepared for cooler temperatures in the evenings and even snow in the latter part of the season. Some ski resorts will open in early November. What to pack: Fall is a great time to break out cozy sweaters and knits in Salt Lake. While most days are pleasant, calling for a light sweater or even a long-sleeve T-shirt, nights can be colder, so pack a heavier jacket or fleece pullover to keep warm. Salt Lake City's winters are cold, with temperatures typically below freezing and large accumulations of snow, both in the valley and surrounding mountain elevations. Despite this, the city remains a popular destination for travelers, thanks to the surrounding ski resorts which boast some of the best powder in the world. 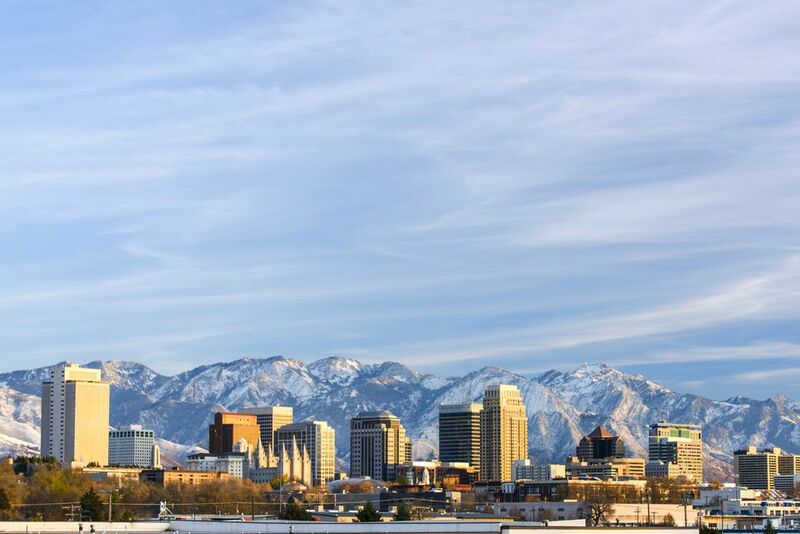 Whether you enjoy skiing, snowboarding, or snowshoeing, you'll have a great time in Salt Lake City. What to pack: Winter in Salt Lake isn't unusually wet if you don't count snow, but it is cold! Pack heavy winter gear, including a waterproof coat (ideally down) as well as multiple layers and winter accessories like a scarf, gloves, and a good hat. Sturdy, waterproof shoes are always a good idea too, especially for possible icy sidewalks.